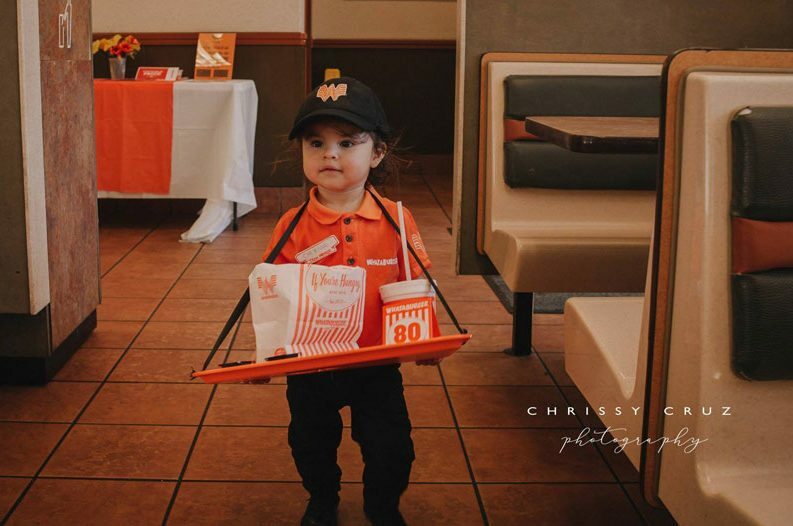 In case you haven't had your daily dose of "aww" yet, check out this Texas mom who dressed up her daughter as a toddler Whataburger employee for Halloween. Chrissy Cruz Photography shared the images of 18-month-old Cheyenne with the story behind it on her Facebook page. When Cruz was pregnant, she constantly craved Whataburger. Now that her daughter is old enough to enjoy trick-or-treating, she chose to dress her up as mommy's favorite craving. "[Cheyenne's] first fast food was Whataburger fries, and boy did she love it!," Cruze wrote. "So this Halloween I decided to make my daughter Halloween costume. Meet your youngest Whataburger employee!" READ MORE: Viral Article Says Texans Prefer In-N-Out to Whataburger... Seriously? She couldn't have done it without the cooperation of two Whataburger locations, one in Mesquite and one in Sachse. The restaurants allowed Cruz to photograph inside and outside and even gave the little girl her own team member name badge! Click through to the post to see all the truly precious pictures.